On the morning of May 21, 1856 an armed force of as many as 800 men descended upon the newly formed town of Lawrence in the Territory of Kansas and proceeded to systematically destroy it. With this act, the town of Lawrence became the first casualty in America's Civil War that would officially be declared five years later. The motivation for this attack was rooted in an issue that had been a smoldering source of contention since the establishment of the Union - slavery. For years, Congress had been gingerly constructing compromises in an effort to calm regional tensions by maintaining the balance of the number of Slave and Free states admitted to the Union as the country expanded westward. 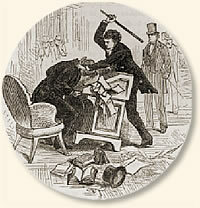 Congress's latest attempt was the Compromise of 1850. Among other stipulations, this act specified that California would be admitted as a Free State and established the Fugitive Slave Act (see Return of a Fugitive Slave, 1854). However, the antipathy between pro and anti-slavery advocates was heightened by plans to build a railroad that would stretch westward from the Mississippi River to California. Before this could be accomplished, the territory through which the railroad was planned would have to be organized, particularly the Nebraska Territory that included Kansas. Senator Stephen Douglas of Illinois orchestrated the passage in 1854 of the Nebraska-Kansas Act that created the territories of Nebraska and Kansas and further stipulated that a new state's status as Free or Slave would be determined by the popular vote of its residents. Although Senator Douglas’s intention was to ameliorate pro and anti-slavery differences, the seeds of national conflict were sown and “Bleeding Kansas” was born. "Bleeding Kansas" was the term coined by Horace Greeley, publisher of the New York Tribune, to describe the violence that racked the territory and turned it into a battleground for pro and anti-slavery adherents in the mid 1850s. Missouri, Kansas's neighbor, was a slave state and many pro-slavers, labeled as "Border Ruffians," crossed from Missouri into Kansas to assure the territory would enter the Union as a Slave state. The Northern states also sent contingents of anti-slavery supporters into the region while abolitionists such as the Reverend Henry Beecher Stowe supplied them with arms. Not all of the anti-slavery migrants to Kansas were abolitionists, however. The majority were "Free Soilers" who opposed slavery not on moral grounds, but because the plantation system that slavery supported threatened their ability to establish their own small farms. The town of Lawrence, Kansas was established in the Fall of 1854 by anti-slavery immigrants from New England. Close to the Missouri border, it became a haven for anti-slavery advocates and by the Spring of 1856 boasted a population of about 1,500. It also became a prime target of the pro-slavery elements, which had by May 1856, gained control of the Kansas government and pursued a campaign of intimidation and arrest of anti-slavery advocates. 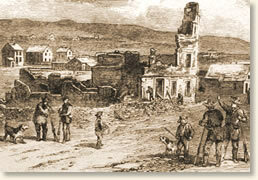 On May 21 a group of "Border Ruffians" augmented by new arrivals from the South gathered at Lawrence's outskirts and looked for an excuse to attack the settlement. The first battle of America's Civil War was about to begin. "The newspaper offices were the first objects of attack." "During the forenoon Fain, the Deputy-Marshal, entered Lawrence with some assistants, to make arrests of its citizens. He failed, however, in provoking the resistance desired, on which to found a pretext for attacking the city; for the citizens permitted the arrests to be made, and responded to his demand for a 'posse' to aid him. . . . The United States Marshal had now, he stated, no more need of the troops; but, as Sheriff Jones had some processes to serve in Lawrence, he would hand them over to him as a posse comitatus. Accordingly, in the afternoon, Jones rode into Lawrence at the head of twenty or more men, mounted and armed, and placed himself in front of the Free-state Hotel, demanding of General Pomeroy the surrender of all arms. He gave him five minutes for his decision, failing which the posse would be ordered to bombard the town. General Pomeroy gave up their brass howitzer and some small pieces, the only arms that were not private property. Jones then demanded the removal of the furniture from the hotel, stating that the District Court for Douglas County had adjudged the hotel and the two free-state newspaper offices to be nuisances, and as nuisances to be removed, and that he was there as Sheriff to execute these indictments and summarily remove the obnoxious buildings. In the mean time the forces had left the hill, and were at the entrance of the town, under Titus and Buford, Atchison and Stringfellow. . . . The newspaper offices were the first objects of attack. First that of the Free State, then that of the Herald of Freedom, underwent a thorough demolition. The presses were in each case broken to pieces, and the offending type carried away to the river. The papers and books were treated in like manner, until the soldiers became weary of carrying them to the Kaw, when they thrust them in piles into the street, and burnt, tore, or otherwise destroyed them. From the printing offices they went to the hotel. . . .
As orders were given to remove the furniture, the wild mob threw the articles out of the windows, but shortly found more congenial employment in emptying the cellars. By this time four cannon had been brought opposite the hotel, and, under Atchison's command, they commenced to batter down the building. In this, however, they failed. The General's 'Now, boys, let her rip' was answered by some of the shot missing the mark, although the breadth of Massachusetts-street alone intervened, and the remainder of some scores of rounds leaving the walls of the hotel unharmed. They then placed kegs of gunpowder in the lower parts of the building, and attempted to blow it up. The only result was the shattering of some of the windows and other limited damage. At length, to complete the work which their own clumsiness or inebriety had rendered difficult hitherto, orders were given to fire the building, in a number of places, and, as a consequence, it was soon encircled in a mass of flames. Before evening, all that remained of the Eldridge House was a portion of one wall standing erect, and for the rest a shapeless heap of ruins. The firing of the cannon had been the signal for most of the women and children in Lawrence to leave the city. This they did, not knowing whither to turn their steps. The male portion of its citizens watched, without offering resistance, the destruction of the buildings named, and next had to see their own houses made the objects of unscrupulous plunder. . The sack of Lawrence occupied the remainder of the afternoon. Sheriff Jones, after gazing on the flames rising from the hotel, and saying that it was 'the happiest day of his life,' dismissed his 'posse' and they immediately commenced their lawless pillage. In this officers and men all participated, and they did not terminate until they had rifled all the principal houses of whatever articles of value they could lay their hands upon, and had destroyed that which they could not carry away. Finally, Governor Robinson's house on Mount Oread was set fire to, after it had been searched for papers and valuables, and its burning walls lit up the evening sky as the army of desperadoes, now wild with plunder and excesses, and maddened with drink, retired from the pillaged city. The value of the property stolen and destroyed during the day in Lawrence is estimated to have amounted to nearly thirty thousand pounds sterling. Life was fortunately not taken, as the inhabitants of Lawrence disappointed their invaders of a fight, by offering no resistance. . . . This eyewitness account was originally published in Gladstone, T.M. The Englishman in Kansas; or, Squatter Life and Border Warfare (1857), republished in: Hart, Albert Bushnell, American History Told by Contemporaries v. 4 (1928); Morrison, Michael A., Slavery and the American West (1997). "The Sack of Lawence, Kansas, 1856" EyeWitness to History, www.eyewitnesstohistory.com (2008). After a popular vote, Kansas entered the Union as a Free State on January 29 1861.